Hot water return systems help maintain hot water in plumbing systems to reduce wait time for hot water at the fixtures, while saving water and energy that would otherwise be wasted. These systems are especially important for residents of condominiums using hot water during off-peak times throughout the day when hot water is not used as frequently. In an effort to accommodate the residents living at 400 E. Randolph in Chicago, Asmir Zenkic, Chief Engineer of the 400 Condominium Association turned to Cecchin Plumbing and Heating, Inc., of Bloomingdale, Ill., and Metropolitan Industries to design a pump package that would provide consistent hot water temperature to the residents within the complex. 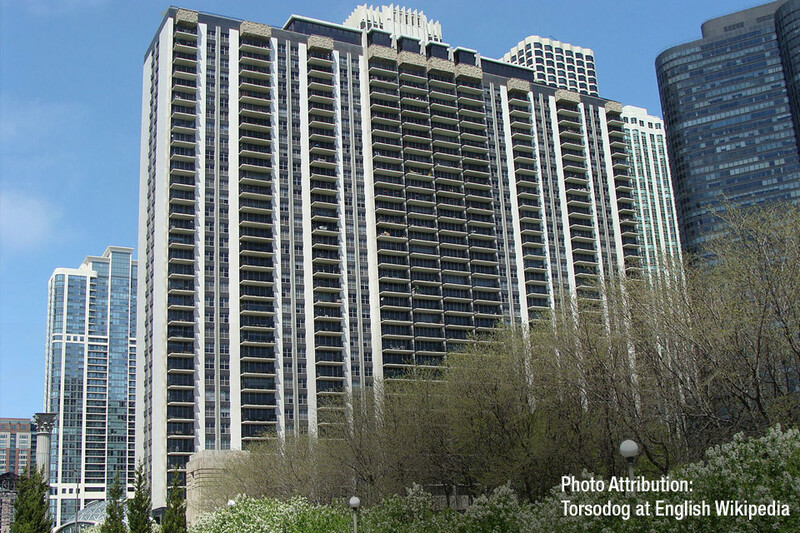 Built in 1963, the building previously known as the Outer Drive East, is situated just off Lake Shore Drive and within walking distance to Grant Park and Millennium Park. Converted to condos in 1973, the 42-story high-rise now houses 956 residential and commercial units. As part of its domestic water piping replacement project over the past four years, Project Manager, Joe Nickele of Cecchin Plumbing and Heating has worked diligently with the complex to replace all domestic water piping throughout the building. One of the final phases of the project addressed the hot water return pumps. The two original hot water return systems that serviced the entire building were inadequate, especially for a building this size, and in desperate need of an upgrade. Included in the upgrade are two customized duplex hot water return pump systems, uniquely designed to run at variable speed in order to meet the energy codes required for the condominium. The design also includes a customized control scheme to measure temperature, flow and pressure on a color touch screen with a programmable controller and an operator interface showing the system status. The first priority is to maintain a temperature of 115 degrees, if the temperature falls below the set point, the control will speed the pump up to create more flow to pull the hot water through the plumbing system and increase the temperature. The building, divided into a high and low zone, maintains consistent temperature to accommodate each unit. Each zone is equipped with a duplex (two pump) system for 100 percent redundancy. The low zone hot water return pump system has been designed to provide a flow-rate between 40 and 90 gpm at a constant discharge pressure of 140 psi, with a minimum net suction pressure of 100 psi. The high zone hot water return pump system is designed to provide a flow-rate between 40 and 90 gpm at a constant discharge pressure of 185 psi, with a minimum net suction pressure of 165 psi. In order to achieve maximum efficiency, it is important that the pumps work within a range of velocity so that the maximum allowable velocity is not exceeded in the pipe, which would cause pressure problems in the pumping zone as the pumps speed up. The building was also re-piped with copper to decrease friction within the system. Since the systems were installed, the goal of more efficiently reducing wait time for hot water has been resolved and the systems are functioning seamlessly as designed. 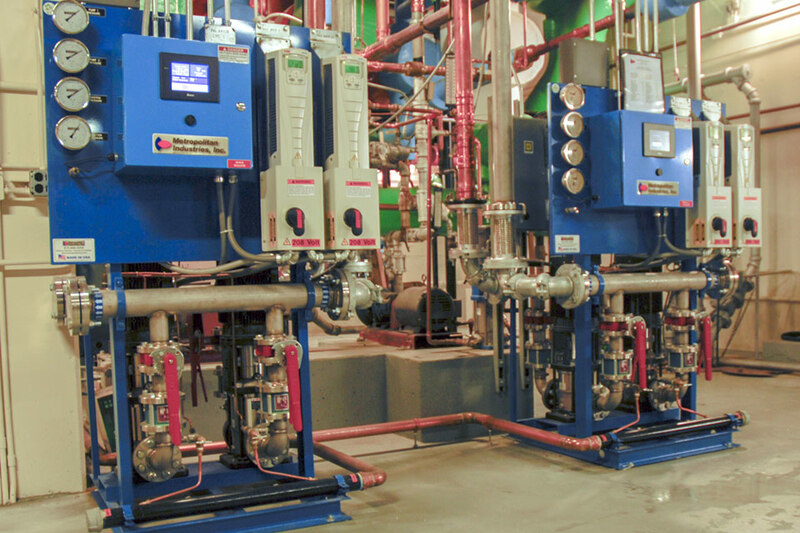 Is Your Building or Infrastructure In Need of an Upgrade in its Hot Water Return Capabilities? Metropolitan’s team of engineers and water system operators can design and assemble a custom solution for your application.